This week's topic is Fourth of July. I don't know who the children are in the picture. I do believe that it is a train in the background, behind the fence. I love the display though. Were they cheering for a parade? Was it a ceremony for soldiers returning from war? Or was it an Independence Day celebration? I don't know, but it certainly looks as though they were having a grand time. On July 4th my family would typically eat watermelon and set off a few backyard fireworks. You know the type...those cobra snake things, sparklers, etc. One year, though, my dad got something called The Screaming Bees. Virginia has strict fireworks laws, and they can't shoot off the ground if they are used at home. In fact, only "fountain fireworks", sparklers, pharoah serpents, pinwheels and whirligigs are permitted. If you want the good stuff then you have to go to South Carolina. Anyhow, I don't know if we got a defunct killer screaming bee deal or what. But that thing shot off and the bee rockets were screaming and my dad took off running. We were all kind of stunned in the aftermath. Ah, good times. Want to join in on Memory Lane Friday? It's easy. Copy the code beneath the button below and paste it into your blog. Next week's topic is 'A Game'. Board games, yard games, computer games, a specific homecoming football game....put a name to your game memory and blog it! Love that picture!! Old pictures are so neat. i found you thru Mom loop comment follow and I am glad I did. I love the old pic especially how dressed up they are. the little girl with her hat and everything. I would love to join your Memory Lane Friday. I'm sure we will be gaming this weekend, now to remember to take pics! I found you through mom loop comment follow. Your blog is really great! I love the old picture you found, that is really cool. I am your newest follower. Found you on the mom-loop- comment-follow, and came on over. I love old photos. I like to imagine the history behind them, wonder about the people in them and what they're doing now. It's like a stack of dominoes: one leads into another. You have a lovely,unique looking blog and I'm looking forward to visiting! I love that old picture! I wonder what was going on there. Sure would be cool if youcould find out, huh? What great memories! I love the picture. You can get fireworks all the the state of South Carolina. My neighbors love to set them off when it gets dark which is JDaniel's bedtime. It makes it interesting. Have a wonderful fourth! Thanks for stopping by and being a member of Mom Loop. Stopping by from Mom Loop! That picture is definitely a keeper. Your story reminded me of one I had forgotten involving a bottle rocket my dad shot off. It went straight to the neighbor's roof (a neighbor who wasn't exactly a friendly or understanding type). Horrified, I went straight inside! What a great old photo! 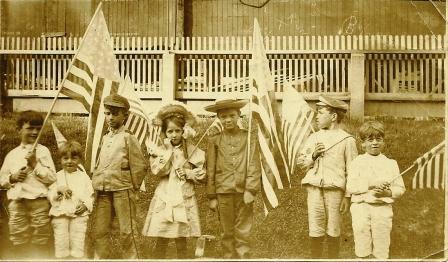 I love photos like that, especially with the kids in the clothing of their time, the big flags! Ahh, dads are always good for some fun, exciting times, aren't they? Hello from MomLoop! That is a great picture! I just went through pictures with my Mother-in-law and found some from 1890! I too love old pictures! Have a great weeked! Your blog is beautiful! I love the design...the old pics are classic! Thanks so much for visiting my blog...following along! I really love the look of your blog! It makes me want to go camping, which is weird because I've never had a desire to do so! Anyway, I remember Screaming Bees! I'm from Pennsylvania and we too have strict rules, though we just drive to the Ohio border and stock up. A few years ago, we accidentally burned down a tree in my mom's backyard. Apparently, it was dead and continued to smolder hours after being hit by a firecracker, but no one noticed! I love old photos. Too funny about your dad :). We've never done fireworks. My dad used to set up flares and we'd watch for hours for them to go off. Was funny in hindsight :).